In this video collection Linda demonstrates exactly how she uses a combination of acrylic paints and inks to create simple little landscapes on watercolour paper and box canvases before developing the same theme into fabric and thread. She produces several decorative, paintings and panels that would be perfect in your own home or would make great gifts. The videos include everything you need to know to create your own landscapes in a variety of formats. 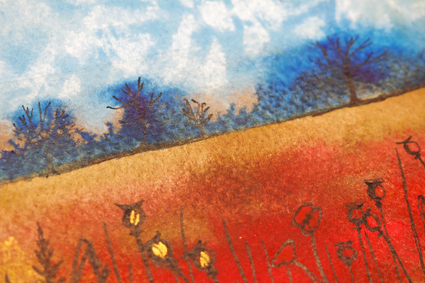 Exploit the qualities of acrylic paint and ink to create a landscape painting on paper or canvas. 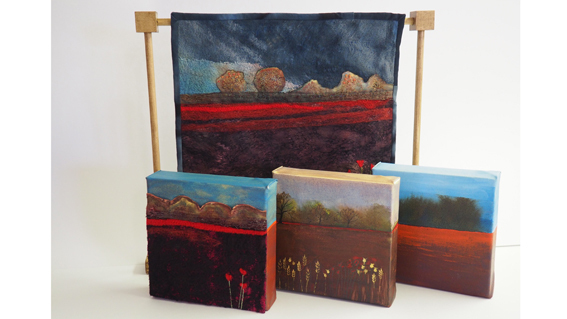 Linda’s working with felting and hand embroidery to take her painted acrylic landscapes one stage further.